Epson 220 vs 220xl Ink Cartridges: Which one will save you money? Are you trying to see which ink cartridge delivers the best value when it comes to page yields? Let’s put the Epson 220 vs 220 XL to the test! Note: Epson 220i vs 220 – all the “i” means after the 220 is that these are the “initial” cartridges that came with the printer, they contain the same amount of ink as replacement 220 cartridges. However 220XL are better value and you will save at least 50% using compatible cartridges. Epson 220 (same as 220i) delivers up to 175 pages with black ink. The cyan, magenta and yellow inks offer color printing up to 165 pages. Epson 220XL page yield is up to 500 pages for each black cartridge and up to 450 pages for each color cartridges. Click here to buy 220XL cartridges and save 50% from House Of Inks, that’s who we use. Most of the printer companies nowadays generate huge profits simply by selling ink cartridges. This part of business is much more profitable than actually creating and selling printers (printers are often sold at a loss!). But when it comes to finding the best model that suits your needs from the Epson family, the Epson 220 XL ink cartridges are an excellent choice. If possible, you should also opt for compatible ink cartridges. These are a lot cheaper when compared to original cartridges, yet they bring a resounding attention to detail, vibrant colors and incredible results. 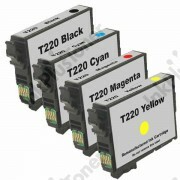 Don’t spend too much on original cartridges, get compatible ink cartridges now and start saving! What makes the ink cartridges for the Epson 220 distinct is the fact that they come with water, bleed, fade and smudge resistance. As a result, the pages you print via this printer will end up being very durable and the quality will last for a very long time. Also, the cartridges are ideal for double sided printing. An interesting thing to note about the Epson 220 cartridges is that they usually come in a 4 pack, which makes it very easy to change cartridges depending on your needs. In regards to the page yield, the Epson 220 delivers up to 175 pages with black ink. The cyan, magenta and yellow inks will offer color printing for up to 165 pages. Epson 220XL is a high capacity ink cartridge created by Epson. Its primary purpose is to provide you with a much better value at a smaller price. You get to print high standard photos and documents with an astounding attention to detail. This is a stellar investment if you print a lot of content often and want a cartridge that delivers vivid colors and water resistance. The Epson 220 XL delivers a DURABrite Ultra Ink that offers fade and smudge resistance. Your resulting prints will look amazing no matter if you use glossy or plain paper! The page yield for the Epson 220XL is up to 500 pages for each black cartridge and up to 450 pages for the color cartridges. While the Epson 220 delivers an excellent value for money, it’s easy to see that the increased ink capacity offered by the Epson 220XL makes it the real winner. Not only does the Epson 220XL pack in more ink, but it allows you to save money in the long term as well. If you have a printer that supports both cartridges, you should consider opting for the Epson 220XL as it has a much higher page yield!